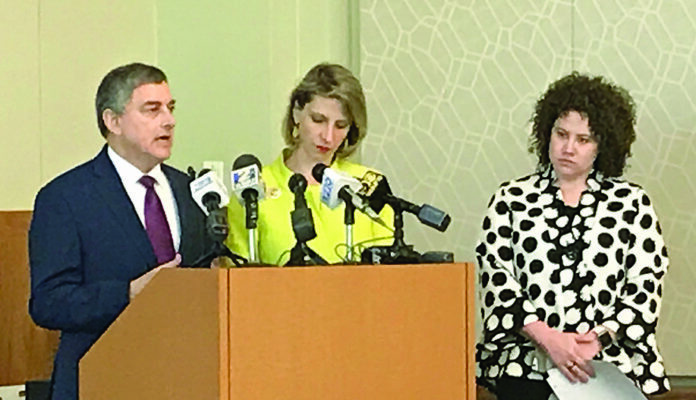 By Devon Sanders/LSU Manship School News Service Commissioner of Administration Jay Dardenne, Health Secretary Rebekah Gee and Deputy Secretary Michelle Alletto spoke Wednesday about letters informing 37,000 Medicaid recipients that they may lose coverage. BATON ROUGE–The Louisiana Department of Health will send letters to 37,000 Medicaid recipients Thursday notifying them that they may be ineligible for services if a budget approved by the Republican-led House is enacted. Under the budget passed by the House, 37,000 individuals would no longer be eligible for Medicaid. About 20,000 of them would be forced out of nursing homes across the state, while others who are unable to live independently would lose access to community homes or in-home services. The cuts would go into effect if legislators are unable to agree to raise additional revenue to solve the state’s projected $648 million budget shortfall for the next fiscal year. The House failed to pass any revenue-raising measures during a special session earlier this year. The Legislature cannot vote on any revenue-raising measures during the current regular session. Edwards, a Democrat, has called on Republican leaders to pass tax measures to replace the hundreds of millions of dollars that will be lost when a temporary one-cent increase in the state sales tax expires on July 1. The governor has said that to avoid balancing the budget mostly with spending cuts, he would call another special session after the regular session adjourns. Michelle Alletto, deputy secretary of the Health Department, said that alerting the Medicaid recipients will allow them to search for other programs, like the federal Supplemental Security Income program, for which they may qualify. Most of the recipients will not be eligible for other services, she said, and the application process for the ones who are could take several months. “For a vast majority, this is their long-term care plan,” Alletto said. A teary-eyed Gee said the decision to send the letters was done for those who would no longer be able to afford the services they once had, and that she and the governor do not want to see the cuts take place. Gee also said while the loss of eligibility would not take place until July 1, sending the letters Thursday was imperative to allow those affected to plan. Republican legislators were not convinced. Henry, the Appropriations Committee chairman, compared the decision to send the letters to what happened in 2016 when Edwards warned that if legislators did not raise revenue, LSU football and other college athletic programs would be suspended. The Senate Republican Caucus released a statement saying the administration’s decision to send the letter was premature. Dardenne acknowledged that the letters might alarm some people. He emphasized that the letter states that the cuts were a possibility, not a certainty. The letters have also garnered national attention. Both Henry and Edwards are expected to appear on CBS News Wednesday night. Edwards is also expected to appear on Good Morning America Thursday morning.